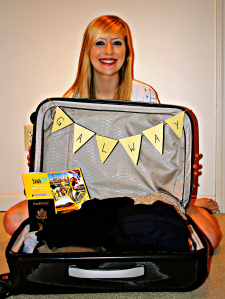 What Do You Pack For a Study Abroad Program in Ireland? Hannah Peterson is a student at the Ohio Northern University and an ISA Featured Blogger. Hannah will be studying abroad with ISA in Galway, Ireland. I’m counting down the days before I embark on this crazy study abroad adventure in Galway, Ireland! With two weeks before my departure, I am trying to prepare myself by finishing last minute packing for a month away from home. To be honest: packing is hard! I don’t know what the weather will be like, what the acceptable fashion is in Galway, how to make style meet comfort and how to do all of this in one suitcase. I’ve been researching what to expect for Galway’s summer weather and what kind of clothing I should pack to make sure I don’t stick out in my dress. This entry was posted in Studying Abroad and tagged Adventure, Ireland, Packing by Irish American Scholars. Bookmark the permalink.